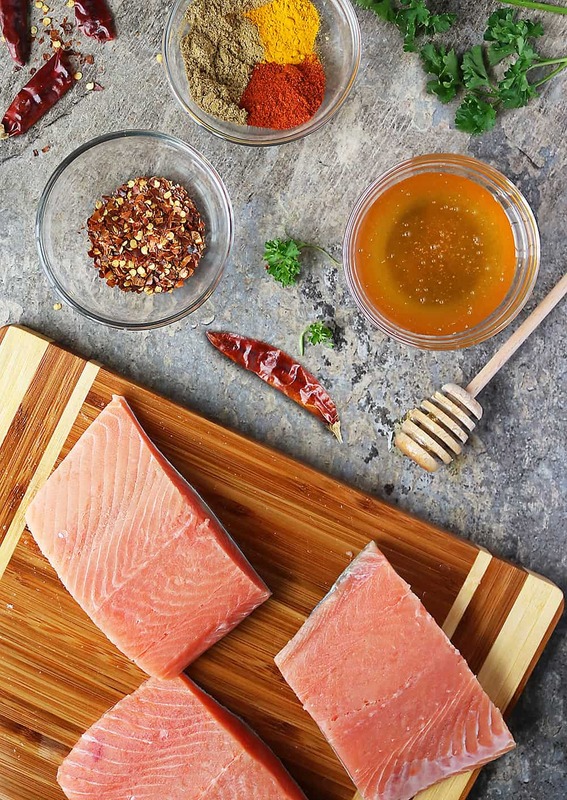 Chili and honey intertwine deliciously in this crispy, Easy Sweet Spicy Air Fryer Salmon recipe. With just 6 ingredients, you can have this salmon on the table in less than 15 minutes. Last Christmas I received a fantastic gift of an Air Fryer from The Feed Feed. Then, earlier this month, I received another one to host a giveaway with (BTW, you still have 3 days to enter to win an air fryer). Well, being surrounded by air fryers meant only one thing for my daughter and I – and that was to use them! Right?! We had just moved to our new home and instead of waiting for the oven to preheat and then take 30+ minutes to bake whatever was on the agenda for dinner, I opted to use the air fryer. Fish and Chips that normally took 40-45 minutes to make, were ready in less than 20 minutes! Crispy chicken tenders were ready in 15 minutes! Cake… err… I dunno, I haven’t tried using my air fryer for desserts… at least… not yet! What I have tried often has been several versions of salmon. 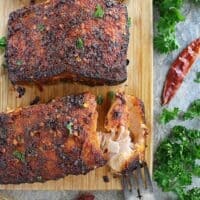 Breaded salmon, blackened spicy salmon, turmeric salmon, and, today, this Easy Sweet Spicy Air Fryer Salmon. I’ve experimented with different temperature settings as well as varied times while using my air fryer, and, what seems to work best for me is a temperature setting of 400 degrees F with the salmon being cooked for 12 minutes. At this temp and time, the salmon is beautifully crispy on the top, and well done on the inside, yet tender. Now, at these settings a slightly thick salmon steak works best – and by that I mean a raw salmon steak that is at least ¾ inch to 1 inch thick. A raw salmon steak that is thinner than that will turn out a lot dryer at these settings – yup, I found that out the hard way! 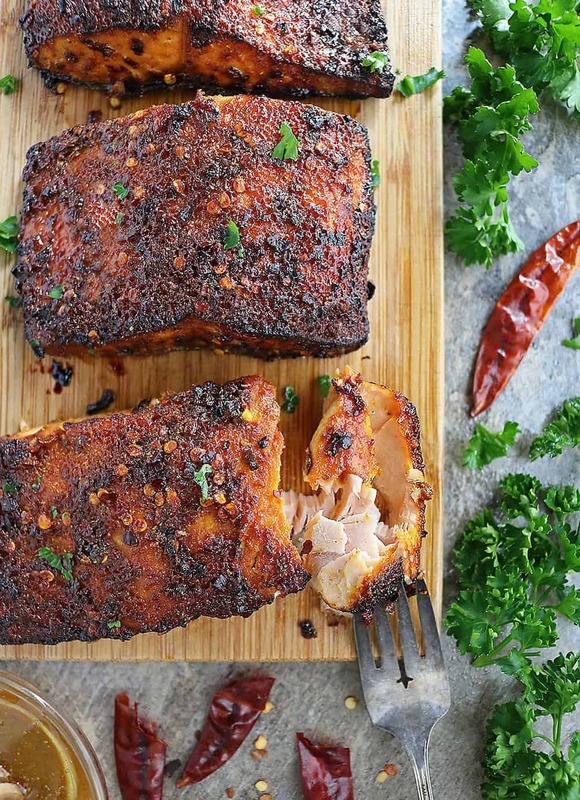 For this Easy Sweet Spicy Air Fryer Salmon, I used a mix of warmed honey, inflammation reducing turmeric, chili powder, coriander and chili flakes. The chili powder and chili flakes added a nice little kick to the salmon while the honey added in a tinge of sweet to tone the spicy down a tad. This Easy Sweet Spicy Air Fryer Salmon is delicious along with some Coconut Pumpkin Pasta, or Sautéed Asparagus Egg Salad, or this Ginger Cardamom Spiced Carrots, or even this Charred Zucchini And Caramelized Onion Salad. 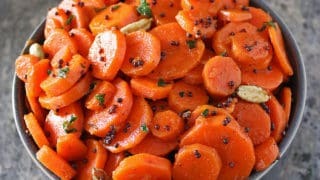 Subtly flavored with mustard seeds and paprika, these Ginger Cardamom Spiced Carrots would make a lovely side dish for your Holiday dinner table or even a snack for everyday! 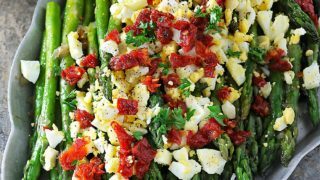 This Sautéed Asparagus Egg Salad with shallots and sundried tomatoes would make a delicious side dish your family would enjoy at a weeknight dinner. Or, whip it up for the mom in your life this Mother’s Day! 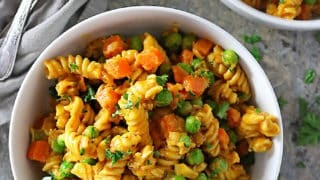 This quick, easy, and thrifty, Creamy Coconut Pumpkin Pasta & Veggie Sauté is the perfectly delicious and nutritious vegetarian meal for those chaotic Fall evenings! 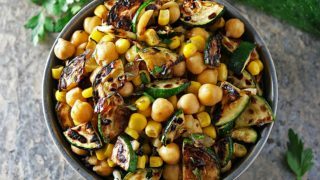 Charred zucchini and caramelized onions add a ton of flavor to this salad – which can be enjoyed as is or as a holiday side! Place honey in a microwave safe dish and heat for 10 seconds until slightly warm. Add in the turmeric, coriander, chili powder, salt, pepper, and chili flakes into the warmed honey and mix very well until all are incorporated. Wash and pat dry the salmon fillets. 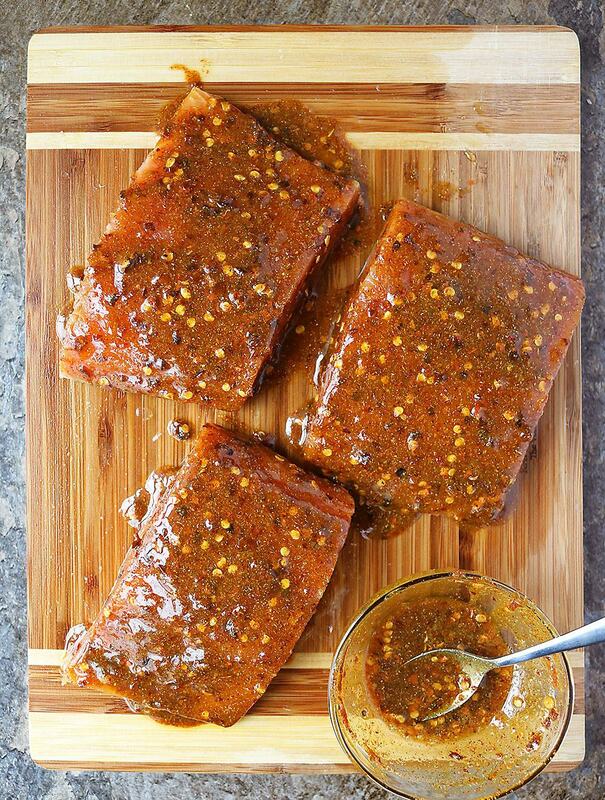 When salmon fillets are dry, spoon on the honey-chili mixture onto each, making sure to coat the sides as well (this is messy and you will have to wash your air-fryer pan). Then, place the salmon fillets in an air fryer, set temperature to 400 degrees and time to 12 minutes. When time is up, remove salmon fillets and enjoy with your favorite sides. Wow! Will definitely be giving this one try in the air fryer – looks like it will come out perfectly! wow This looks amazing! I love the combo of spicy and sweet flavours. I love salmon! Looks so delicious and perfect for dinner! This looks delicious!! I love salmon dishes and this one is right up my alley. It looks like an easy recipe which is full of flavour, thanks for sharing. I just love salmon and always make it the same way, just got a new air fryer and this is a must try soon! thanks! Jeremy and I were literally talking about air fryers the other day! We had one years and years ago, but it was one of those ones where the inside spins, so you couldn’t really cook anything delicate or breaded in it, and of course it ended up breaking after about 4 months. I think it’s fabulous they are making a huge splash again, and I obviously love that they are SO much better designed now! 😉 Anyways, this recipe is just brilliant! Not to mention delicious!!! Gimme all the sweet and spicy salmon! I’m drooling!!!! Cheers! An air fryer is something that has been on my Christmas list for a couple of Christmasses now Shashi. Ha ha! Trouble is that Lynne has said I would need to throw something out in order to get one (as we’ve no more space in our kitchen) and I can’t decide what! If (and when) I do get an air fryer this delicious salmon recipe would be first on the list. I don’t have an air fryer yet but I’m totally going to get one! This salmon looks PERFECT! 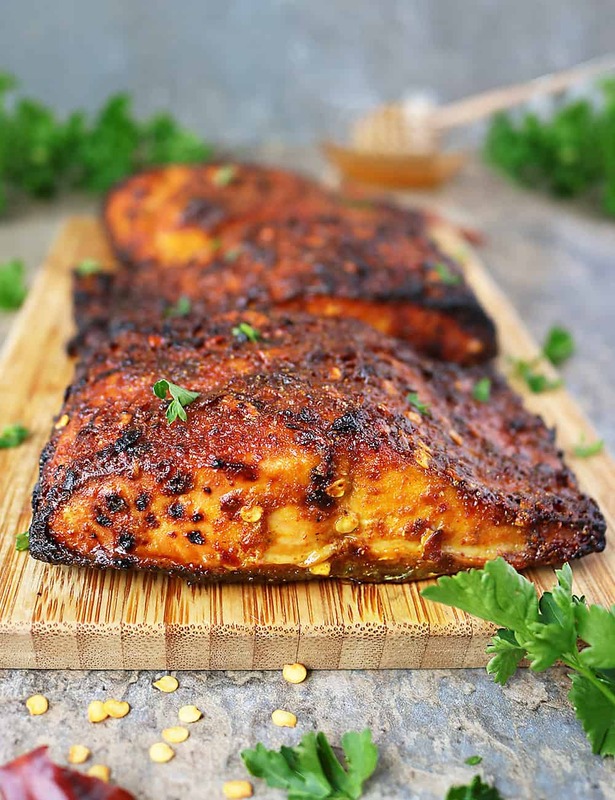 Salmon is my favorite fish and I love your sweet and spicy spin on it :). Have a great weekend!